Longhorn Steakhouse Parmesan Encrusted Asparagus was an appetizer that I fell in love with. I love a great asparagus recipe, and this one fits the bill. Fresh asparagus is captured in a Parmesan crispy shell and served fresh. The spring is the perfect time for new asparagus recipes. The Longhorn Steakhouse is part of the Darden chain, which is part of the company that owns Olive Garden and Red Lobster. I love their themed restaurants and their attention to detail. They select wonderful menu items, and the Longhorn Steakhouse is just one of those. This well-priced steakhouse will soon become a favorite of yours. 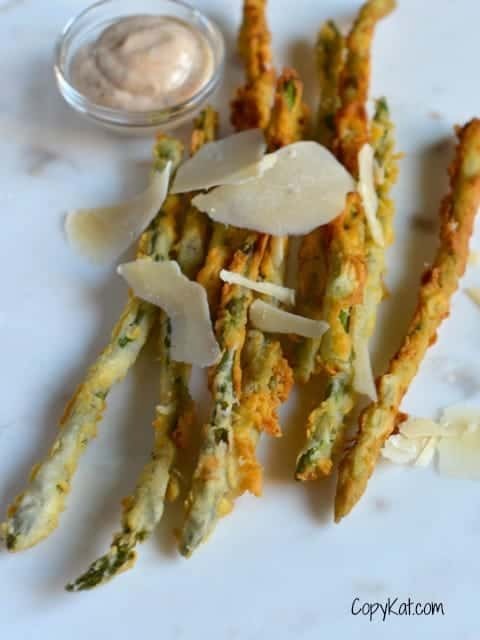 This Parmesan Encrusted Asparagus was quickly a favorite menu item of mine. A few of you wrote to me asking me for this recipe. When I get several people asking I know it is a fantastic find. Asparagus is flash fried with a crispy crust. It makes noshing on this asparagus spears a real delight. They aren’t difficult to make so you can make this recipe at home. You will need a bunch of asparagus. You may want to check out this article for How to Pick Fresh Asparagus from the Kitchn. I like to pick medium sized in terms of thickness for this recipe. You will also need two types of Parmesan, you will need some for making little slivers out of, so you will need a block, and you will also need some that are grated. I don’t often say this, but the kind that is pre-grated, and sold in cans works just fine for this recipe. You may also want to make some sauce to dip in. I simply take some good quality Ranch dressing mix, and add a little chili sauce and we are in business. Garnish with shaved Parmesan. You don't want to miss out on this amazing appetizer. Trim asparagus by removing the bottom inch, you can save the trimmings for soup stock. In a shallow bowl combine flour, grated Parmesan, and seasoned salt. Stir to combine the coating well. In another shallow dish add 2 cups of buttermilk. Coat asparagus first in flour, then dip into buttermilk and then dredge in the Parmesan coating again. Place the coated asparagus on a wire rack. Repeat with all asparagus. Allow asparagus to rest about 5 minutes before frying. Add enough oil to your cooking vessel to cover the bottom 2 inches. I like to use vegetable oil, corn oil, or even cotton seed oil. Heat oil to 350 degrees. Drop a few pieces in at a time, and fry until golden brown. Remove golden asparagus and allow to drain on a wire rack. You may want to serve this with some Ranch dipping sauce. do you mean the kind of parmesan that is finely grated in the jars in the grocery store? Could this be made in an air fryer? glad to find this now that Longhorn has stopped selling my all time favorite appetizer. ???? Not on their menu, but can still be ordered. We just had it. Can’t wait to try this, got my ingredients today, going to do test run then, hopefully we can have it for Easter! You said that Longhorn no longer served this but I had it there today and it was delicious. I love it. It was so tender and just right. I live it with lots of batter and that’s the way it was today. Worth every penny. Have to get it every time I am there as well as the Flo’s Filet steak. Never had a bad one. If is no longer served at the Longhorn Restaurant we visit, in Liberty, MO. We love this! Thank you for posting this recipe! Ours in AZ doesn’t have it. I was super bummed. First you said Long Horn Steakhouse then you said Long Star Steakhouse. Anyway I made this and it was very good. Long Horn has stopped serving this so I am glad to make this at home. what about the dip or sauce that Longhorn serves with the parm crusted asparagus? I don’t know what it is but it has a little kick to it! Delicious. I will have to work on that one. It’s served with red chili ranch. Just drop some red chili sauce or red chili seasoning into ranch dressing and stir. I use homemade ranch with chipotle chili powder and it tastes just like it! Whole milk would work ok. Other milk such as 2% or skim will not work. Sounds very easy! Do you have a recipe for Jet’s Pizza Ranch Dressing? Awesome recipe….absolutely delicious!! Just to make sure, this is from the Longhorn Steakhouse correct? Because at the end of the video you said Lonestar lol! Yes, I meant to say Longhorn Steakhouse, I made a mistake on the video. Thank you for your suggestion. I bet this would be a great way to trick chicken to eating more vegetables! Wow, wow, WOW Stephanie! This sounds fantastic! Thank you Toni! That means a lot coming from you. Where do you use the slivered Parmesan? You garnish the asparagus when it is done cooking. I hope this helps. I love you Stephanie! 🙂 Thank you for developing a copycat version of this delicious recipe!! Can’t wait to try this at home! I hope you get a chance to try out this dish. Thanks for checking this recipe out.